The United Nations Environment Assembly (UNEA), the world's highest-level decision-making body on the environment, met for the fourth time in Nairobi on 11-15 March 2019 to address environmental challenges and sustainable consumption and production. A record 27 resolutions were proposed regarding topics such as Marine Plastic Litter, Single-use Plastics, Sustainable Consumption and Production, and Gender Equality. Working in conjunction with NGOs from all around the world, our team was there in Nairobi providing expert-level resources and consultations to inform and support the negotiations. 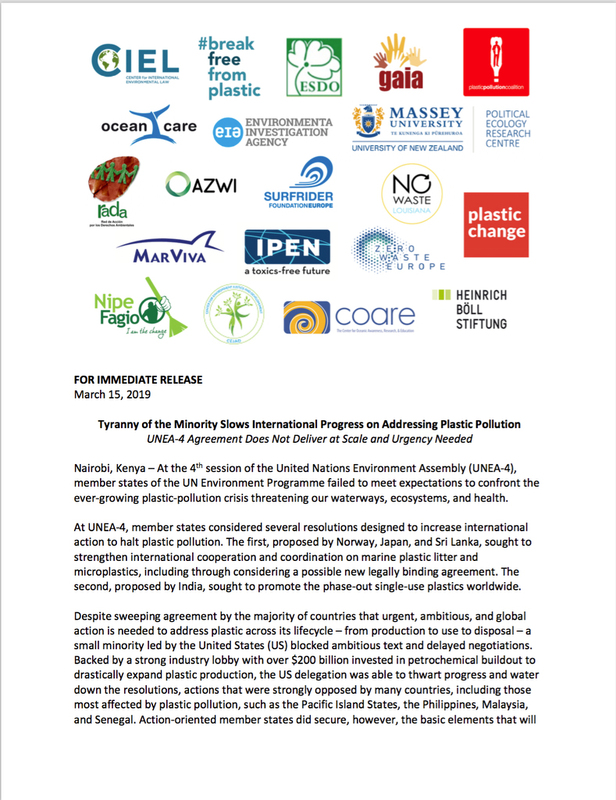 In-person discussion and negotiations of these resolutions began a week prior to UNEA, and continued into the week, with a very small number of countries led by they U.S. derailing progress to appease industry interests. At the end of Assembly, weakened language in both the Ministerial Declaration and a number of Resolutions was put forth for adoption by the nearly 200 ministers and heads of state. While more robust and comprehensive measures are truly required to address the urgent matters ahead, this was the first time that a global decision to address single-use plastics was made. The delegation from the United States – backed by a strong industry lobby with more than $200 billion invested in petrochemical buildout to drastically expand plastic production – did its best to hinder progress in the negotiations for nearly two weeks. Once the Ministerial Declaration and the various resolutions were put forth for final adoption, even though they had badgered other countries to weaken the language and scope, the delegation from the United States demanded the floor and stated that it was formally "disassociating" from the Declaration as well as each of the resolutions. Our hope was to strengthen international cooperation and coordination on marine plastic litter and microplastics, including through the consideration of a possible new legally binding agreement, but those aims were thwarted by industry interests. However, by extending the mandate of the Expert Group established at UNEA-3. the other Member States were able to secure the basic elements that will allow continued discussions and future actions. 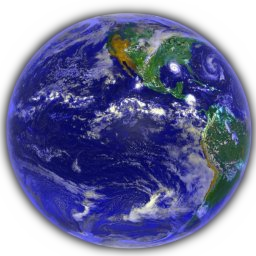 The extension of this mandate keeps plastic on the international agenda and provides an opportunity to consider a future legally binding agreement. Click here to download a copy of the group Press Release (1.2Mb PDF). Remember the adage, "Think Globally; Act Locally"
Demand that government officials take an active and supportive approach towards international cooperation.